Providing employees with relevant, context-specific information is crucial to achieve productivity and efficiency while executing business processes. Today, tools exist to model various aspects of organizations such as processes, organization structures, services, and their descriptions. However, there still exists a gap between information modeling on a conceptual level and information provision on a runtime level that hinders information dissemination and retrieval while employees execute processes. In daily business life, information workers demand for unstructured content to fulfill well-defined process steps. 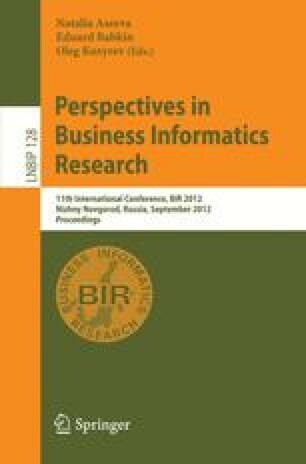 In this paper, we adapt an existing conceptual approach of process-driven information requirements engineering and present its prototypical implementation based on an industry-developed BPM product. Our solution therefore introduces “information objects” and integrates these with process activities to model the users’ information requirements at process runtime. In doing so, users are empowered to leverage context information such as documents, reports, or emails, while executing human steps in a process.